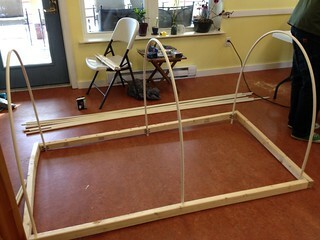 Last spring I was inspired by Dana’s post on cold frames/hoop houses over at the Druid’s Garden. Though we didn’t have enough money in the budget for these in the community garden last year, I really wanted to make sure we didn’t go another season without them. So last weekend myself, my mother-in-law, and three other folks put in about four hours and constructed a nice batch of hoop houses for four of the raised beds in the community garden. Half-inch conduit brackets hold the PVC in place. Working off of Dana’s notes and a few random pieces of advice gathered by Google-fu, I designed these to rest just on top of the soil of the raised beds, making them 3.5′ by 6′ in size. I hadn’t used a circular saw since stage crew in high school, but it came back pretty quickly. The best piece of advice I got from Dana’s post was to use these nifty little conduit brackets from the electrical section of the hardware store to serve as guides for the PVC pipes (1/2″ diameter). 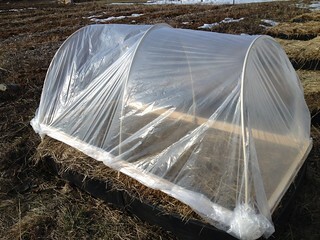 The PVC slides right into them, allowing the frame to be anchored in the soil once outside. First, measure out all your pieces. Then on the long boards, place and mark where the brackets will fall (one of our group made a template out of a short piece of PVC with two brackets taped to it, which made this step really fast and easy): two sets should be about an inch from the ends, and the third set should be right in the middle (3′ mark). 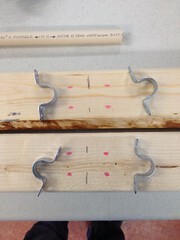 Use a drill to then fix all the brackets in place with 3/4″ screws. 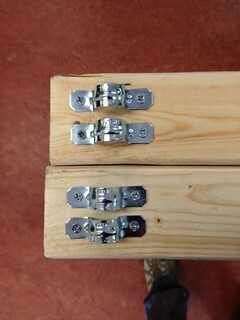 Next, using the 3″ screws, attach the two long sides and two short sides together to make a rectangle. Insert the PVC into one set of brackets, bending it until it slides into the set directly across. It should be starting to look like a hoop house now! Finally, take the plastic sheeting and mark the halfway point on the short side. Match this to the center point of the short side of the frame, and then double over the edge and staple in place. Work from the center to the edges on one short side, then the other; lastly, repeat this on the long sides, miter the corners and voilà! 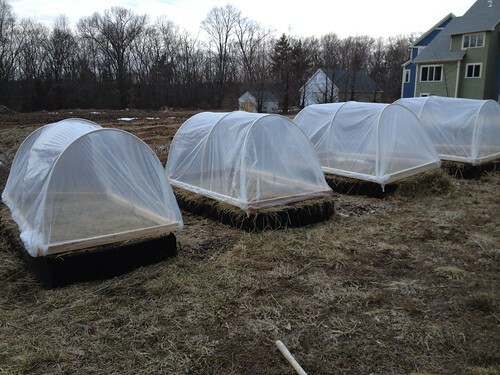 You are the proud owner of your own hoop house!